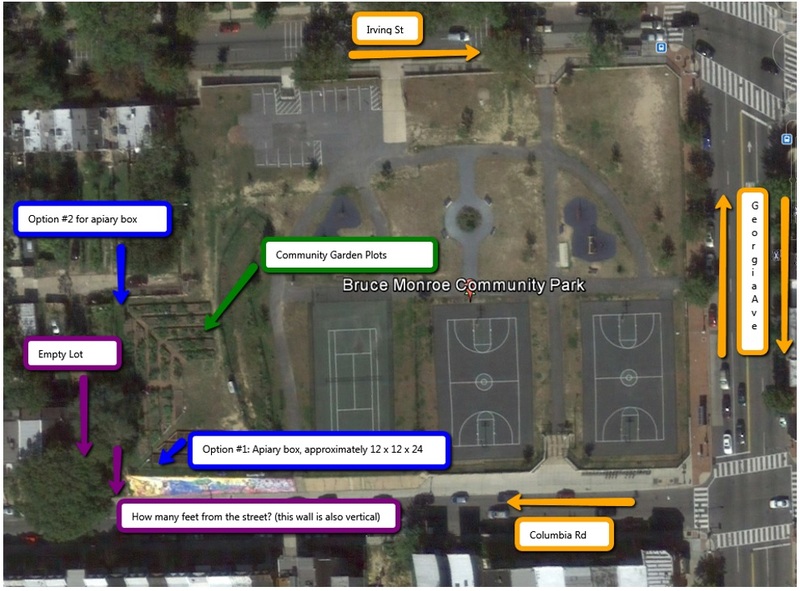 ANC1A Supports Apiary at Bruce Monroe Community Garden | Park View, D.C.
At last night’s meeting of ANC 1A, Commissioner Rashida Brown introduced a letter of support for an apiary (aka the place where honeybees are kept) to be added to the Bruce Monroe Community Garden. Support for the apiary was unanimous. According to the presentation, the garden will begin with one hive, which is approximately 12 x 24 x 24 feet which will have a locked fence around it. Signage will also be posted in English and Spanish. There are currently around 20 apiaries in Washington, with local examples as near as Wangari Garden and the Twin Oaks Community Garden. Below is a diagram indicates the two locations where the apiary may be located at the garden. This entry was posted on March 12, 2015 at 7:01 am and is filed under Parks and Green spaces. You can subscribe via RSS 2.0 feed to this post's comments. That’s too bad that a big expensive fence will be required but I sure understand why after seeing the vandalization of the compost bins, little library, and all signs.